WHO/Europe | 105th Global Health Histories seminar: If medicine is art, can art be medicine? Health topics Environment and health Urban health 105th Global Health Histories seminar: If medicine is art, can art be medicine? 105th Global Health Histories seminar: If medicine is art, can art be medicine? A growing evidence base shows that there are real, physiological benefits to cultural participation. Singing in a choir, for example, can improve health outcomes for people with chronic lung diseases. Participating in art therapy, experts are saying, can reduce trauma for those suffering from post-traumatic stress disorder. Governments across Europe and the world are realizing that there are untapped, low-risk and often highly cost-effective health and well-being benefits to cultural participation. 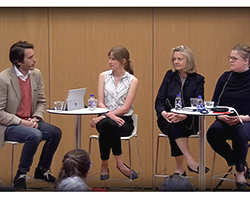 On 8 May 2018, WHO/Europe and the WHO Collaborating Centre for Global Health Histories based at the University of York (United Kingdom) brought together 3 international experts in a panel discussion to explore the potential for prescribing art as a remedy to improve health and well-being. “We see an increasing number of issues which have to be addressed where we believe that cultural participation could be part of the answer,” said Ms Eva Bergquist, Head of the Department of Culture in Stockholm City Council. Dr Daisy Fancourt, Wellcome Research Fellow at University College London (United Kingdom), explained that with over 40 000 museums in Europe, the United States of America and Canada alone, there is arguably an enormous public health resource that has remained untapped. The WHO European Healthy Cities Network epitomizes this multisectoral approach. Enhancing the physical, social and cultural spaces we inhabit through careful design is vital to improving health and well-being. Yet, as Ms Monika Kosinska, Programme Manager of Governance for Health at WHO/Europe, pointed out, this can only be done with the right skills mix. To support Member States in better understanding the promise of arts and health interventions, WHO/Europe is developing a Health Evidence Network (HEN) synthesis report on arts for health that will provide policy-makers with policy considerations based on the best available evidence. To watch the recording of this event, please follow the link to the Global Health Histories YouTube channel below. Video – Cultural contexts of health and well-being: Can art save lives?